If your dog gets into a hassle with another dog, quickly grab your dog's back legs and pull him backwards like a wheelbarrow. This renders him helpless. NEVER get between the two dogs!! Exercise gets rid of anxiety and agressive behavior. A 30- minute walk every day or a good run at the dog park (if your dog is socialized) does the trick. You will not correct unstable behavior (such as agression, fear or neurosis) by giving your dog affection. It actually works the opposite way. Giving affection during these times will encourage their undesireable behavior and block their mind from growing out if it. It is like saying "good dog" to bad behavior. Be consistent: Repetition will make the message clear and allow them to learn. Your goal is to keep your dog in a calm, submissive state of mind. Has your cat or dog been on antibiotics recently? If so, a very important step, that your vet may not have told you about, is to follow up with a good probiotic with enzymes. Like people, when pets take antibiotics, not only do the antibiotics kill the bad bacteria but they also kill the good (the flora), which is needed for aiding in digestion and other healthy body functions. Therefore, administering a probiotic once a day for about 2 weeks after they are done with the antibiotic, will restore their system to a healthy state. Some pets have reactions from being vaccinated. There is a homeopathic product called Thuja 30c (available at Whole Foods) that you can give them to relieve the unwanted side effects (vomiting, not eating, lethargy, etc. )​ And Remember . . . never vaccinate your pet if they are sick, stressed, or recovering from an injury or illness. There are many ways you can drive a dog nuts — and you probably aren't even aware of them. So if you want to be your dog's best friend, find out how you can fix your annoying habits. Sometimes, dogs get impatient with our mixed signals. Don't you want to do better? Dogs try to be our best friends, but boy do we ever make it difficult sometimes. Here are some of the things we do that might make dogs question whether they want to remain best buds or cut ties completely. We’re a vocal species. We love to chatter away, even at our pets, who can’t understand the vast majority of what we’re saying. Dogs might be able to deduce what a few key words mean — walk, treat, toy, off — and maybe even learn hundreds of words as some border collies have done. But they can’t understand human language. What they rely on to figure out what we mean is our body language. Dogs have evolved to be expert readers of the human body and can figure out what you’re thinking and feeling before you even realize you’re thinking and feeling it. But we can easily send mixed signals if we are only paying attention to what our mouths are saying and not what our bodies are saying. If you go to any beginning dog training class, you’ll see plenty of people saying one thing, doing another, and a confused dog trying to figure out what in the world is wanted of them. For instance, telling a dog to “stay” while leaning forward toward the dog and holding out a hand like a traffic cop is, in body language, actually inviting the dog to come toward you. But when the dog does, she gets reprimanded for breaking her stay command. It’s all so confusing! A great experiment (and something that will probably have your dog sighing with relief) is to try to spend a whole day not saying a word to your dog, but communicating only with your body. You’ll realize just how much you “talk” with your body without realizing it, how to use your movements and body position to get the response you need from your dog during training, and how involved a conversation can be without emitting a single sound. While you might love wrapping your arms around a furry canine friend, most dogs hate hugs. We as primates think hugs are awesome and express support, love, joy and other emotions through hugs. It’s totally normal to us to wrap our arms around something and squeeze, and it only means good things. But dogs did not evolve this way. Canids don’t have arms and they don’t hug. Rather than camaraderie, if a dog places a foreleg or paw on the back of another dog, this is considered an act of dominance. No matter your intentions with hugging, a dog is hardwired to view the act of hugging as you exerting your dominance. Many dogs will tolerate it with grace — the smiling face of the family golden retriever with a child’s arms wrapped around it comes to mind. But some dogs will feel threatened, fearful, or just flat out loathe the feeling — and in fact, a child grabbing a dog for a hug is why many dog bites occur. Also, the same dog that enjoys one person's hug might react entirely differently with another family member who tries the same thing. You'd be hard-pressed to find a dog that actually enjoys or seeks out hugs. If you’re wondering if your dog hates your hugs, just pay attention to her body language when you go in for a cuddle. Does she tense up? Lean her head away from you? Avoid even a hint of eye contact? Lick her lips? Keep her mouth closed? Pull her ears back against her head? All of these are signs that a dog is uncomfortable. Yes, even the dog licking her lips while someone snuggles her is not showing that she is overcome with love, it is showing submissive, even nervous behavior. So next time you want to go in for a hug, pay very close attention to whether or not the dog is okay with it. After all, you’re putting your face right next to a set of sharp teeth. Do you like to be patted on the head? My guess is no. Having someone reach out and tap us on the head, no matter how lovingly, is not something most of us enjoy. It’s annoying at best and painful at worst. And we really don’t want the hands of strangers reaching toward our face. If someone were to reach their hand toward your face, I’m guessing your reaction would be to pull your head back and lean away, and get a little tense about the invasion of personal space. Yet most humans think that dogs like being patted on the head. The reality is that while many dogs will put up with this if it’s someone they know and trust, most dogs don’t enjoy it. You may notice that even the loving family dog might lean away slightly when you reach for her face to pet her. She’ll let you because you’re the boss, but she doesn't like it. It’s a personal space issue for dogs just as much as it is for us. This is why responsible parents teach their children to gently pet a dog’s back or rear, but don’t pat, and definitely don’t go for the dog's face. If you really want to reward your dog for being awesome, don’t bang on their head, but give them a rub on their rear end right by the tail. They’ll thank you for it! We all know how powerful eye contact is. While we view steady eye contact as important, as a sign of trustworthiness or focus, we have to also be aware that eye contact can feel unnerving, uncomfortable and domineering. It’s creepy when a stranger looks us in the eye without breaking contact, especially as they’re approaching. It’s clear their attention is zeroed in, but what is their intention? We have to read the rest of their face for the cues. Eye contact is part of establishing dominance for many species, and in humans, we can use the tiniest of details about the rest of the face — the softness or hardness of the muscles around the eyes and mouth — to determine if the stare is friendly or not. And even then, it’s still creepy to have a stranger stare at us! It feels the same way for dogs. When you look a strange dog right in the eye, unblinking, you might be smiling and trying to warm up to them but the dog is probably reading it as an act of dominance or even aggression. They might display a submissive response — looking away, doing a little wiggle for pets, rolling over onto their backs — or they might start backing up and barking. Either way, for most dogs, a stranger looking it right in the eye while approaching is not a comfortable situation. If you want to say hello to a new dog in a way that is comfortable for both of you, approach with your body angled slightly (not with your shoulders squared toward the dog), your eyes slightly averted, and speak quietly with a gentle voice. All these body language cues of friendship will help a dog understand you mean no harm. The dog might still want nothing to do with you, but at least you didn’t approach in a scary way that could cause a defensive or aggressive reaction. Dogs want, need, and love having rules. You might think having strict rules makes life boring or unhappy for your dog. But dogs really want to know what’s what according to their leader. And really, it’s not so hard to relate as humans. Children thrive when they have a consistent set of rules to follow, and they do less well in environments that provide them a free-for-all. Think about polite, well-balanced kids you know, and the spoiled kids who lack social skills or throw temper tantrums when they don’t get what they want. Which set of kids are the ones with consistently enforced rules and boundaries? And which set tends to be most consistently happy? With dogs, it’s pretty much the same thing. Rules make life a lot more predictable, a lot less confusing and a lot less stressful. And speaking of confusing, dogs don’t understand exceptions to rules. They don’t understand that they’re allowed to jump on you when you have leisure clothes on but not when you have work clothes on. They don’t understand that they’re allowed on the couch after a bath but not after coming in from a romp in the mud. Additionally, saying “No” for breaking a rule but not actually doing something to help the dog stop the behavior and learn the rule doesn’t count as enforcement. Dogs thrive when they know where the boundaries are, and when you spend time enforcing consistent boundaries with positive rewards, you also are building up their trust in you as a leader. You’re setting up conditions for a very happy dog! Just like so many other social species, dogs have their favorite friends and their enemies. It is easy to see what other dogs — and people, for that matter — that a dog wants to hang out with and those with whom she’d rather not associate. Yet, there are a lot of dog owners who go into denial about this or simply fail to read the cues their dog is giving them. It is common for overly enthusiastic owners to push their dog (sometimes literally) into social situations at dog parks when their dog would rather just go home. Or they allow strangers to pet their dog even when she is showing clear signs of wanting to be left alone. It is important to note that there is a difference between positive encouragement with shy, fearful, or reactive dogs. Taking small steps to encourage them out of their comfort zone and giving them rewards for any amount of calm, happy social behavior is important to helping them live a balanced life. But knowing the difference between gentle, rewards-based boundary pushing and forcing an interaction is vital to your dog's safety and sanity. 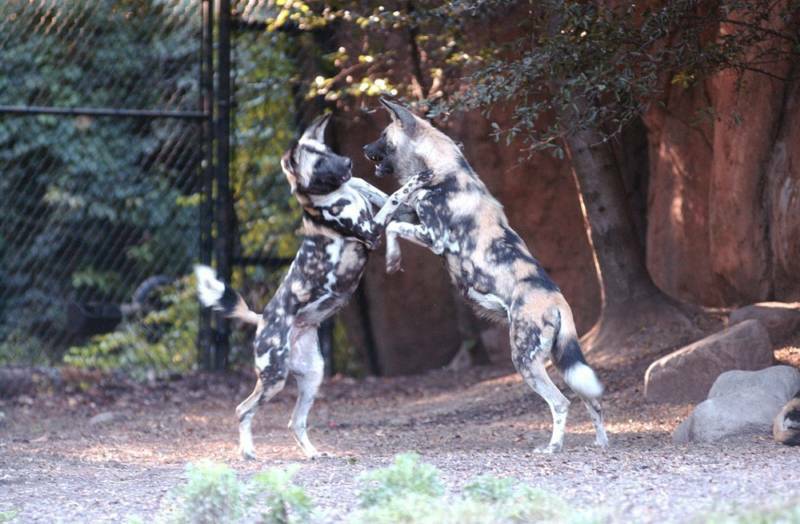 When dogs are pushed too far in social situations, they’re more likely to lash out with a bite or a fight. They’ve given cue after cue — ignoring, avoiding, maybe even growling — and finally they’ve had enough and give the clearest message of all with their teeth. What is possibly even worse, is that their trust in you as a protective leader is eroded, and they have an even more negative association with a park, a certain dog or person, or a general social setting. So do your dog a favor: read the body language she gives you when she doesn’t want to be around certain other individuals and don’t force it. There are walks, and there are walks. It’s definitely important to have a dog that knows how to walk obediently on a leash. However, it’s also important to allow a dog to have some time to explore her surroundings while walking obediently on a leash. Dogs see with their noses, and they place as much importance on their sense of smell as we humans place on our sense of vision for interpreting the world around us. It’s probably safe to say that dogs appreciate the smell of a tree trunk the way we appreciate a beautiful sunset. Dogs loathe not being able to take in their world for at least a few minutes a day, and too often we humans are focused on going on walks for the sole purpose of exercise or potty breaks. We trudge along the same old route, often without any variety or sense of leisure, and in too much of a hurry to get back home again. Do your dog a favor and dedicate one of your daily walks to having a "smell walk" — going slow and letting your dog take in the world with her nose. Go somewhere entirely new, explore a different neighborhood or trail, let your dog sniff at a spot until she gets her fill, even if it's for minutes at a time before moving forward. For helping your dog know the difference between a walk where she should be obedient and stay beside you, and a walk where she is free to explore, you can have a special backpack or harness that you use only for smell walks. Just make sure it is something very different from your usual collar and leash set-up so the different purpose for the walk is obvious to your dog. These walks are a wonderful opportunity for your dog to get some of the mental and sensory stimulation that keeps life interesting for her. Just as dogs are amazing at reading our body language, they’re amazing at reading our tension levels even through the leash. By keeping a tight leash on a dog, you’re raising the level of stress, frustration, and excitement for your dog, and conversely, for you. I know what you might be thinking: “I don’t want to hold a tight leash, but I have to. My dog is the one pulling, not me!” But this is why it is so important to teach a dog how to walk on a slack leash. An amazing amount of energy is transferred between you and your dog through that little strip of canvas or leather. By keeping a loose leash, you’re letting your dog know that everything is fine and dandy, that there’s no reason to be worried or tense. With a slack leash you’re saying to your dog that you are calm and have everything under control so your dog is free to be calm as well. On the other hand, by keeping a tight leash you’re sending a message to your dog that you’re tense, nervous, on alert, ready to fight or fly, and your dog responds in kind. Just as you don’t like your dog pulling you around, it doesn’t feel good to your dog to constantly be pulled and thus cued to be on alert. They’re also well-aware that they can’t get away from you even if they think they need to. A dog that walks on a tight leash is more apt to bark or be reactive in even the most mild of social situations. But a dog that can walk on a slack leash is more likely to be calm. This is a difficult thing to master, and something the majority of dog owners can commiserate about, but it is so important to having pleasant walks with a relaxed dog. Tension on the leash isn’t the only way a dog can pick up how you’re feeling. You can tell when a person you’re around is feeling tense, even if you don’t realize it. Dogs have the same ability. The more stressed and wound-up you are, the more stressed and wound-up your dog is. And dogs, just like us, don’t like that feeling. You might roll your eyes, but the next time your dog is acting frustrated and tense, check in with yourself — have you been feeling that way for the last few minutes, for the last few hours, or the last few days? Your dog might just be acting as your mirror. If you need a reason to meditate, helping your dog calm down is a great one. You know that feeling of being stuck hanging around someone who is totally boring? Think back: remember having to be with your parents while they ran grown-up errands? None of which revolved around a toy store or park, of course. Remember that feeling of barely being able to contain yourself, of wanting to squirm and groan and complain. You couldn't take part in the adult conversation, which was boring anyway, and you were told to sit still and hush. But oh boy did you ever want to just moooove! Just run around the block or something to break the monotony. That's how your dog feels when you're busy being that boring grown-up. Dogs abhor it when we're boring. And it's hard not to be! We get home from work and we want to unwind, to get a few chores done, to make dinner and sack out on the couch and relax. But that's about the most annoying thing we could do to our dogs who have been waiting around all day for us to finally play with them. If your dog is making trouble — getting into boxes or closets, eating shoes or chewing on table legs — she's basically showing you just how incredibly bored she is. Luckily, there is a quick and easy solution to this: training games. Teaching your dog a new trick, working on old tricks, playing a game of "find it" with a favorite toy, or going out and using a walk as a chance to work on urban agility, are all ways to stimulate both your dog's mind and body. An hour of training is worth a couple hours playing a repetitive game of fetch in terms of wearing a dog out. While of course exercise and walks are important, adding in some brain work will make your dog happy-tired. Even just 15-30 minutes of trick training a day will make a big difference.